Zacharias writes in plain letters, so all could read, "His name is John." TIME OF great rejoicing had come to the quiet little home in the hill-country of Judah, for God had sent the promised child to Zacharias and his aged wife, Elizabeth. And all the neighbors and relatives were rejoicing with these happy parents of the baby boy. When the child was eight days old preparations were made to give him a name, for this was the custom of the Jews. The friends and relatives said,"Let us call him Zacharias, after the name of his father." 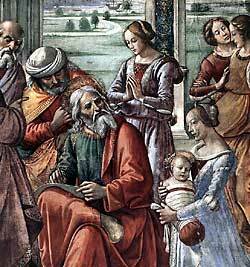 But Elizabeth answered, 'No, do not call him Zacharias, for his name is John." Why do you wish to call him John?" they asked in surprised. "You have no relatives who are called by that name." Then they turned to the old father, who had not spoken since the angel talked with him in the temple, and by making signs they asked him what they should call the child. Zacharias understood what they wished to know, and he motioned for them to bring a writing-table. This they did. Then he wrote in plain letters, so all could read, "His name is John." "How strange!" thought the people. And all at once Zacharias began to speak to them again, just as he used to speak before he had seen the angel. And he praised God for giving him this wonderful baby boy. News of this wonderful baby spread all through the hill-country, and people became much interested in him. They heard how the angel had appeared to Zacharias in the temple and promised that God would give the child, and they heard how Zacharias had been unable to speak from that time until after the baby was called by the name that the angel had given. They wondered much about these strange happenings, and they believed that surely the baby John would grow up into a great man. Zacharias received wisdom from God and spoke words of prophecy to his neighbors and friends about his little son. He blessed the Lord. And then he said to his little boy, "You, my child, shall be called the prophet of the Highest, for you shall go before the face of the Lord to prepare his ways. You shall give knowledge of salvation to his people by the remission of their sins, through the tender mercy of our God." Many other words did Zacharias speak; and his words came true, for the Spirit of God caused him to speak those words. And Zacharias cared for his little son as long as he lived. He watched with pride the changes that came with the years in the life of his little boy. And he saw that God was blessing John and causing him to grow strong and brave. Perhaps Zacharias and Elizabeth did not live to see the day when John become a very useful man for God, for he did not begin his great work until he was thirty years old. Until that time he lived quietly in the desert country, and studied the books that God's prophets had written. He also listened much to the voice of God, and learned to understand God's will.